One of these are perfect with a mid-morning coffee. 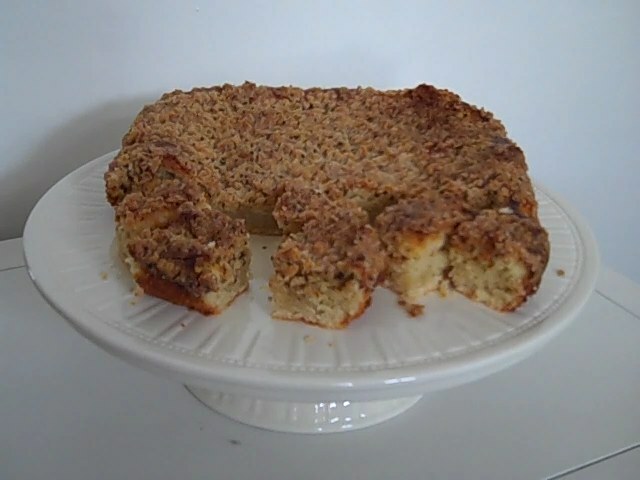 The crumb topping is sweet and streusel-like, in contrast to the light sponge underneath it. Pre heat oven to 180C/gas 4. Grease and line a 18cm/7in square cake tin. For the topping, put the plain flour, butter, mixed spice and coffee in a food processor and blend until the mixture resembles coarse breadcrumbs. Add the sugar and blend again for 2 minutes. For the sponge, put the butter, sugar, egg, soured cream and self raising flour in the processor and blend until smooth and creamy, then turn it into the prepared tin and level the top with a spoon. Sprinkle the crumb mixture in an even layer on top. Bake for 35 – 40 minutes until just risen and firm to the touch. Leave in the tin for 10 minutes before transferring to a wire rack to cool completely. This is a nice easy cake to make if you don’t have the time to be cutting out, shaping & making fondant items to decorate it with. This is an 8”/21cm cake. You need to start this cake the night before you want to cook it. All you do is weigh out the dried fruit and mixed peel, place it in a mixing bowl and mix in the hot tea. Cover the bowl with a clean tea towel and leave the fruit to absorb the tea for up to 12 hours. Next day pre-heat the oven to gas mark 1, 275°F (140°C). Then measure out all the rest of the ingredients. The treacle will be easier to measure if you remove the lid and place the tin in a small pan of barely simmering water. Now begin the cake by sifting the flour, salt and spices into a large mixing bowl. Next, in a separate large mixing bowl, whisk the butter and sugar together until it’s light, pale and fluffy. Now beat the eggs in a separate bowl and add them to the creamed mixture a tablespoonful at a time; keep the whisk running until all the egg is incorporated. If you add the eggs slowly by degrees like this the mixture won’t curdle. If it does, don’t worry, any cake full of such beautiful things can’t fail to taste good! When all the egg has been added, fold in the flour and spices, using gentle, folding movements and not beating at all (this is to keep all that precious air in). Now fold in the fruit, peel and treacle and finally the grated lemon and orange zests. Next, using a large kitchen spoon, transfer the cake mixture into the prepared tin, spread it out evenly with the back of a spoon. Finally cover the top of the cake with a double square of baking parchment with a 50p-size hole in the centre (this gives extra protection during the long slow cooking). Bake the cake on the lowest shelf of the oven for 4½-4¾ hours. Sometimes it can take up to ½-¾ hour longer than this, but in any case don’t look till at least 4 hours have passed. Cool the cake for 30 minutes in the tin, then remove it to a wire rack to finish cooling. When it’s cold ‘feed’ it – make small holes in the top and base of the cake with a cocktail stick or small skewer, then spoon over a few teaspoons of brandy, wrap it in foil secured with an elastic band and store in an airtight container. You can now feed it at odd intervals until you need to ice it. This particular cake has no alcohol in it. You don’t have to add alcohol if you don’t want it. To decorate, melt 3 Tbsp of jam in the microwave and brush all over the cake. Roll out the marzipan to fit over and around the cake and place onto the cake, smoothing down with your hand. You now need to leave it to dry, for about least 2 days. Again, melt 3 Tbsp of the jam. Roll out the fondant, as you did the marzipan. Place the fondant onto the marzipaned cake. Attach your plastic decorations and cake frill. I made this simple yet effective cake for a friend. This was made in a 6”/16cm cake tin. 1 ¼ lb mixed dried fruit, soaked overnight in the liquid of choice. For this I used tea as my friend didn’t want alcohol in it. 7-inch cake tin lined with greaseproof paper, place the tin on the paper and draw around it to get the right size for the lining on the inside. Put the dried fruit in a bowl and pour on your liquid for soaking – no need to measure just keep on adding until the liquid gets to the top of the fruit. Cover tightly with a clean tea towel and leave overnight. Then when you’re ready to finish the cake, first line your cake tin with greaseproof paper and turn your oven on to Gas Mark 1 (140C or 275F). Then get another large bowl and add your softened butter and sugar. Give it a quick mix with a wooden spoon, there’s no need to go the whole hog and bash it until it’s properly creamed. Then crack in your eggs and add the rest of the dried ingredients. Strain the dried fruit from any remaining liquid and add this into the large bowl. Give it all a stir until the dried fruit is evenly covered. You want quite a stiff cake mix at this point, the wooden spoon should stand up unaided in the mix. If the mix is so stiff that you’re finding it hard to get the spoon in and stir then add a swish of saved liquid. But if the cake mix is too sloppy then add a tablespoon or so of flour and stir. Then heave it all into the lined cake tin and put it in the oven for 3 hours. You’ll know when the cake is done because the now solidified cake mix will have detached itself from the edge of the tin and shrunk inwards a bit. Also your kitchen will be smelling wonderful. Remove from the oven and allow to cool in the tin, for at least 45 minutes – 1 hour, then turn out onto a wire rack to cool completely. To decorate, melt 3 Tbsp of jam in the microwave and brush all over the cake. Roll out the marzipan to fit over and around the cake, I rolled mine into a 12”/31cm circle, and place onto the cake, smoothing down with your hand. 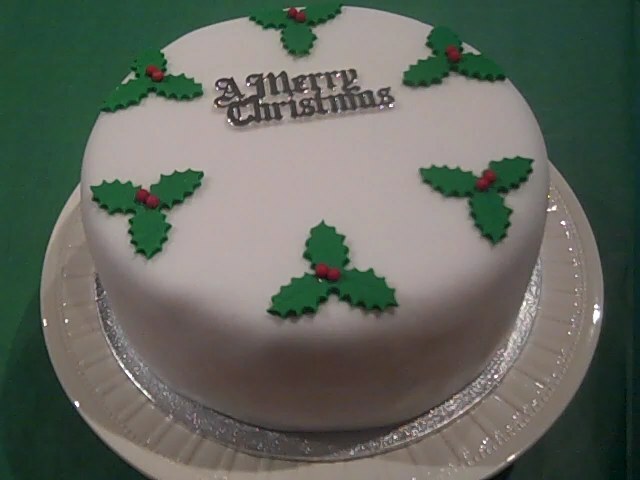 Colour the left over fondant green, and using holly cutters, cut out some holly leaves. Attach them with a brush just slightly dampened with water then add the berries.